Witness how Sea Turtles nest & hatch in Bocas del Toro! Turtle Tours at Bluff Beach: depending on when you're in Bocas, get to watch Sea Turtles lay their eggs or hatch and then make their way to the ocean. Cost is $25 - $35 pp. Includes local guide & roundtrip transportation from Bocas Town to Bluff Beach. 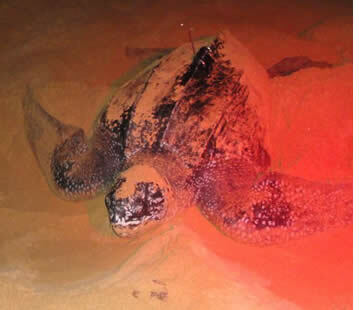 Sea Turtle Volunteer Programs: stay at secluded beaches in Bastimentos Island or at Playa Soropta in the mainland and patrol the coast at night to ensure sea turtles can lay their eggs. Turtle Hatching and Nesting Season in Bocas del Toro: depending on the species, nesting can go from March until September, and hatching from May until November. If you're staying on Isla Colón or Carenero Island, the easiest and most convenient way to watch Sea Turtles lay their eggs or hatch from them is at Bluff Beach. Bluff Beach is certainly one of the most beautiful beaches in the entire Archipelago and is known for its vast stretches of pristine golden sand and its powerful surf. Bluff Beach is about a 20 minute drive from Bocas Town and you'll rarely find it crowded with tourists. The small community of Bluff Beach is in charge of managing tourists visiting the beach for turtle watching purposes as well as patrolling the beach every night during turtle nesting season to ensure the eggs are safely laid and then placed in safe grounds. 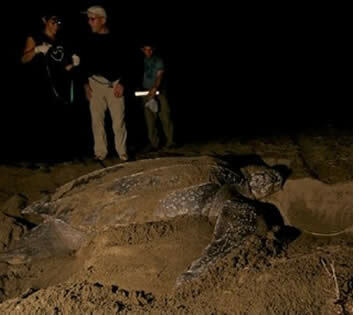 Both Leatherback and Hawksbill (Carey) Turtles lay their eggs at Bluff Beach. During nesting season (March until September depending on the species), turtles can arrive at anytime during the evening. Sometimes it can be as early as 8 p.m. or a couple of hours before dawn. When you sign up for this tour, we will call at your hotel if the turtles arrive to the beach before 10 p.m. and then you'll be picked up at your hotel and taken to Bluff Beach. If the turtles don't arrive, the tour won't go and in this way you won't waste your time or spend your money. After spending a couple of hours at Bluff Beach you'll then be returned to Bocas Town. It is also possible for us to arrange dinner for you at one of the restaurants at Bluff Beach and then just hang out there until the turtles arrive. 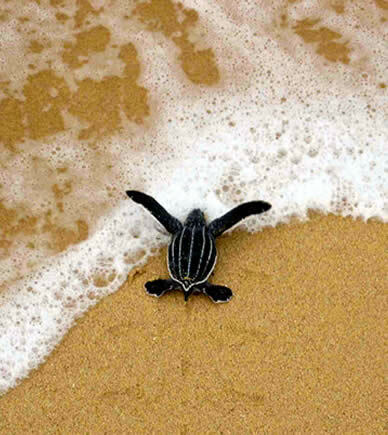 Turtle hatching (May until November) can take place at anytime during the day. The same arrangement for the turtle tour is made as with the nesting: the local guides will give us a call once some turtles start to hatch and we will pick you up in Bocas Town and take you to Bluff Beach. * Prices are in US Dollars. The above prices are per person and do not include Panama's 7% ITBMS Sales. Rates include local guide and roundtrip transportation from Bocas Town to Bluff Beach. Please wear dark clothing, use a red flashlight (white light confuses the turtles). By joining this turtle tour you're directly supporting the community's conservation efforts and giving them tangible reasons to keep taking care of the sea turtles year after year. The Gnobe Indian guides are trained by marine biologists and funded by the tours they offer. Some think it's a good idea to go on your own to see the turtles nest but it is necessary have a guide because tourists aren't fully aware of the proper practices and precautions required to see the turtles without being disruptive. If the turtles are in anyway frightened or distracted, they may not leave the water to bury their eggs. As a volunteer you'll patrol the beaches at night, and you'll have to cover 6 to 12 kms per night. Normally shifts take 4 hours long but it will depend on the amount of volunteers. When you or your team spot a turtle, you'll tag and measure the turtle and wait until it lays its eggs. Depending on where the eggs were laid, you might also be required to relocate the eggs to a safer location (and count them). During the day volunteers can rest, enjoy the surroundings, interact with the local community or can also help with other tasks, such as repairs of the facilities, paint, clean, etc. Volunteers are required to commit to at least 7 full nights of work and 2 days of training. Spots available to volunteer are limited so to ensure placement please sign up in advance. 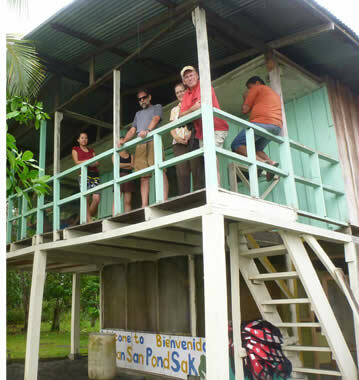 The volunteer camp at Playa Larga in the Bastimentos National Marine Park can accommodate 6 - 8 volunteers at any given time and volunteers also have to assist with cooking and other activities. Playa Soropta at the San San Pond Sak Wetlands on mainland has capacity for 18 persons, there is also space for tents and volunteers do not need to cook. Volunteer facilities are fairly basic and volunteers should know that they'll be in direct contact with nature. Volunteers are required to donate $195 USD per week which covers the costs of meals, accommodation and transportation, in addition to one payment of $10 to cover the National Park Entrance Fee (in the case of Playa Larga at Bastimentos). Habla Ya students pay a $50 setup fee and non students a $75 USD setup fee. Volunteer work starts in late February preparing everything for nesting season and goes throughout September when the last turtles hatch. The peak of turtle activity generally takes place in June and July. 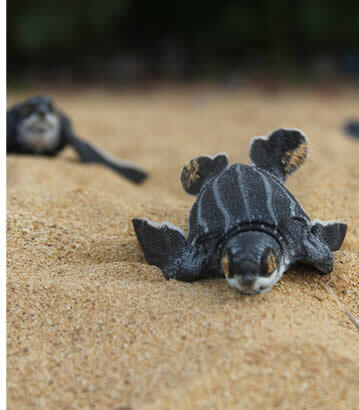 If you can't commit to volunteer for 1 week, but would still like to see the turtles nest (or hatch), check out the Turtle Watching Tour at Bluff Beach. Nesting period for the Tortuga Canal Dermochelys Coriacea or Leatherback Sea Turtle is from March 1st until July 15th (but can sometimes be extended to 15th of August if there is a lot of turtle activity). The nesting activity for the Tortuga Carey or Hawksbill is from May 1st until September. Nesting season is when the most help is needed. Leatherback eggs hatch about 50 to 78 days after they are laid so the first hatching normally starts around May and the last in September. Hawksbill hatch about 50 to 70 days after they are laid so the first hatching takes place at the end of June and the very last can even take place in November. Nature is difficult to predict. But most of the time, there is a lot of turtle activity taking place in June and July. A Unique and Humbling Wildlife Experience! Don't miss out on this opportunity... Contact us!